The Isle of Man Railway determined early on that its 1873-supplied 3-plank open goods wagons (“H” stock) with a centre drop-side door were not well suited to carrying ballast and other loose extracted materials, so invited tenders in 1876 for a new wagon body design suited to such purpose. Metropolitan Carriage & Wagon Co had supplied the initial rolling stock for the Railway, but the Ashbury Carriage & Wagon Co were awarded the new contract and supplied the first four 2-plank drop-side ‘ballast’ wagons in 1877 (along with a number of other vehicles ordered at the same time). The railway acquired three similar wagons second-hand in 1884, built by Ashbury for another customer. 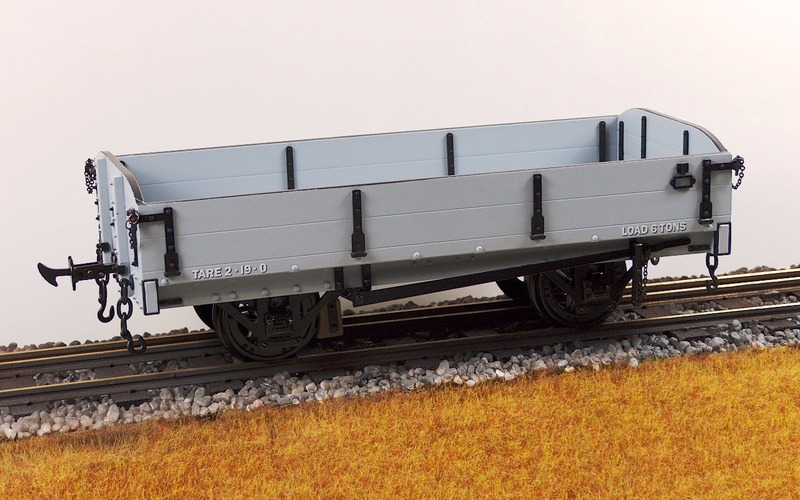 An additional twelve of these ballast wagons were purchased new in 1888, again from Ashbury, followed by a further eight from Metropolitan in 1899, all to the same basic early-type design. 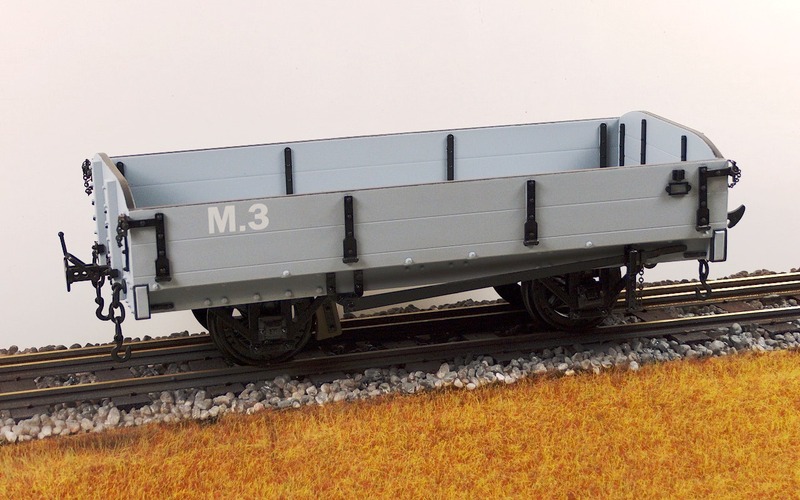 The early-type ballast wagons were allocated the stock letter “M” and numbered M.1 to M.27. Together with fifteen similar wagons inherited from the Manx Northern Railway in 1904 and a further thirty-six of an improved later-type purchased new from Metropolitan between 1911 and 1926, the “M” wagons were the most numerous stock type on the Isle of Man Railway. A number of the early-type wagons remained in use until the 1960’s, the last examples being scrapped in 1975.
other tar products needing to be transported around the island. 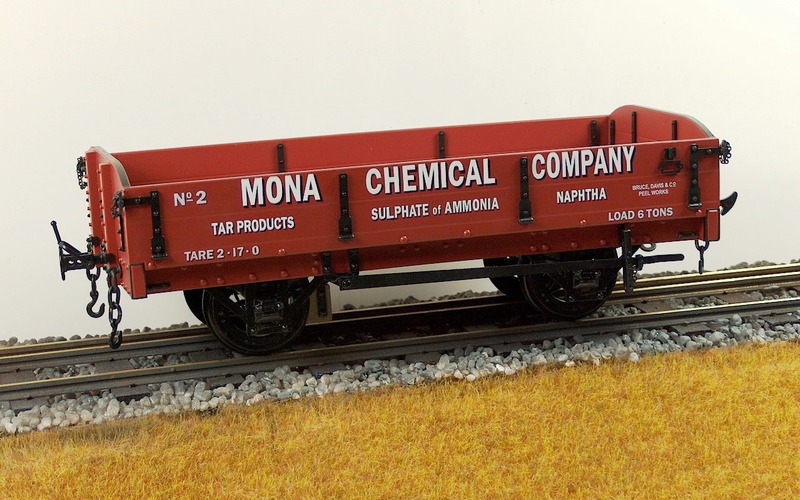 Records indicate that in 1884, on the advice of the Manx Northern Railway, the Mona Chemical Company leased three wagons built by Ashbury Railway Carriage & Iron Works, similar in design to the M wagons previously supplied to the Isle of Man Railway. The three new wagons were subsequently purchased by the IMR and became M.5 to M.7 in their goods stock. The limited edition model (three different running numbers) depicts a private owner livery for the Peel-based chemical works. Body length is 217.5mm, body width 98mm, overall maximum width 104mm. 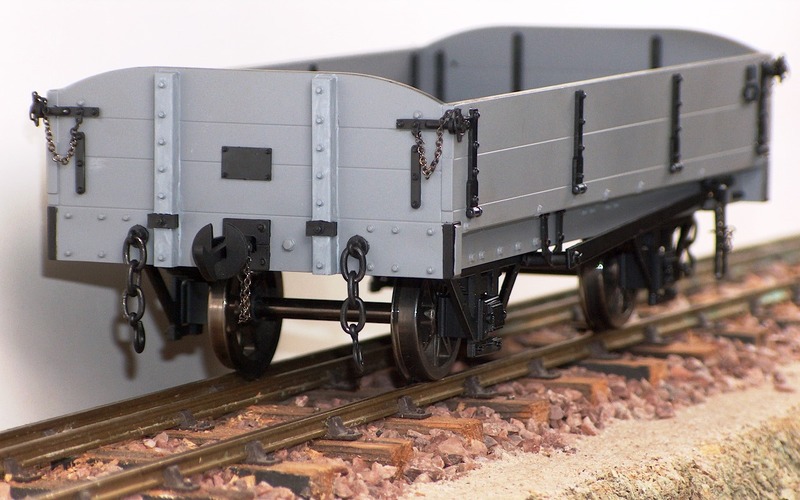 This model features prototypical IMR spoked wheels and scale working IoM couplings. The scale working IoM couplings will couple to other Accucraft stock, and additionally provision has been made for anyone to easily fit standard Accucraft chopper couplings if they want, or if they have to because of very tight curves. The scale couplings will handle 2′ radius curves (LGB R2). Whilst the coupling height of the wagon will naturally be IoM height there is an adaptor plate in the box for anyone who wants to set the couplings to the lower 16mm height. It is be possible to use either the Scale IoM couplings or the standard Accucraft couplings at either IoM or 16mm scale height. R20-1A – Isle of Man ‘M’ wagon in light grey, early era – #M1, #M14, #M19 & #M26. R20-1B – Isle of Man ‘M’ wagon in light grey, late era – #M3, #M12, #M18 & #M23. R20-1C – Isle of Man ‘M’ wagon in light grey – data only.